It was a very cool Friday morning when I went to meet a friend in Port Hope. 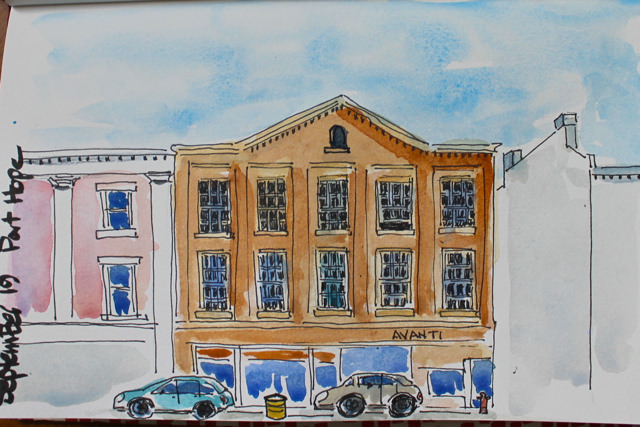 While I was waiting, I sat on a steel chair outside a cafe and sketched the buildings across the street. I was wearing my arm warmers for the first time this season and still was shivering. However, this building pulled me in; I was struck by its perfect symmetry, six brick columns encasing ten casement windows. I’ve said before that this is what keeps me sketching old buildings, actually seeing such history and design when you look up. The street-side windows reveal the sorry state of small town downtowns–and Port Hope is surviving much better than many–but the glories are still there if you just look up. Trusting your own personal response to a building is far more important when sketching architecture than achieving absolutely accurate proportions or perfect perspective. I don’t think so much about the bricks and mortar as I do the skill that designed and put it all together. The act of sketching becomes more than just observing an inanimate object – it generates an exciting personal connection with the mind (and often genius) of the original creator and even the culture of a different era. 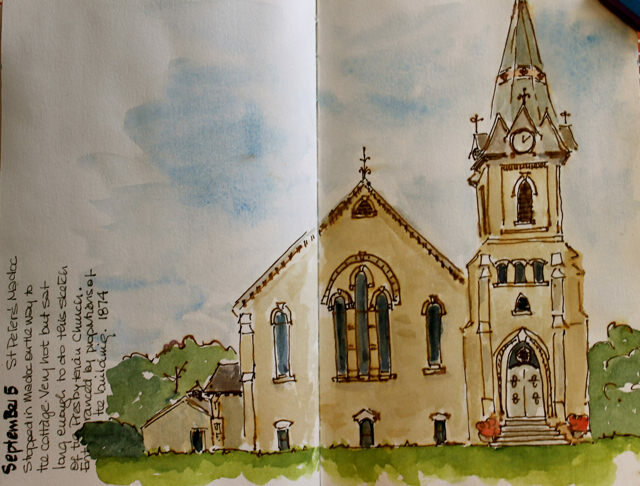 I am thrilled that Liz is offering an online course, Sketching Now Foundations. I know there is a danger to doing too many courses–and Sketchbook Skool Storytelling starts this Friday–but I’ve long been hoping that Liz would offer an online course and I can’t wait. It is her set of lessons in Sketchbook Skool that I refer to most often. I like her approach and her subject matter. 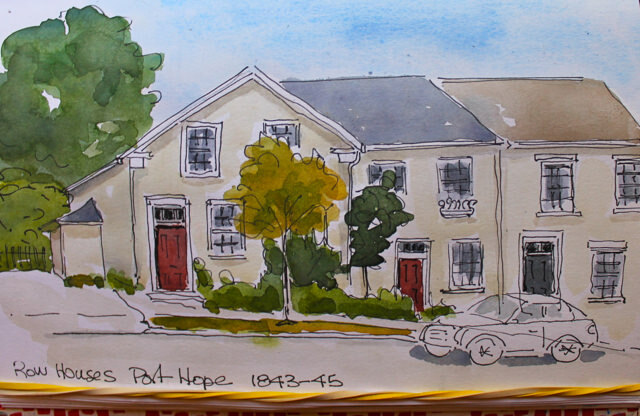 Here is another sketch from that day in Port Hope, a set of row houses dating from 1845. Last Friday we were in Kingston for the Writersfest (highly recommended!) and I had time to sit in the park and sketch the City Hall, one of my favourite buildings. 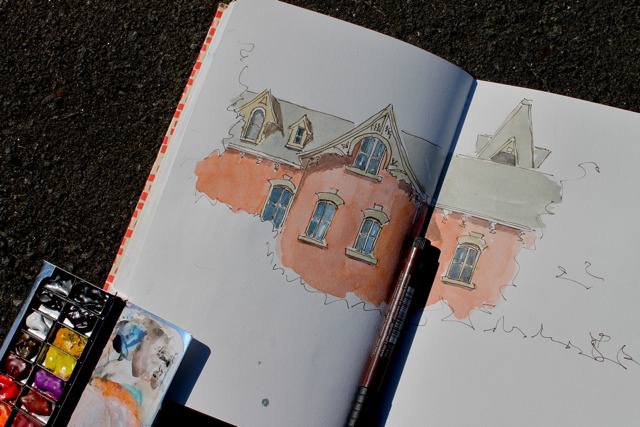 This day, so unlike the week before, was warm and sunny and outside sketching was perfect. 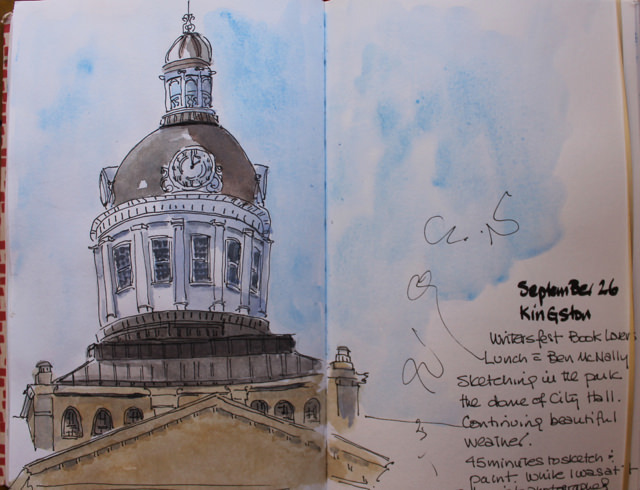 Kingston has many tourists and on such a beautiful day many stopped to talk and even photograph the sketch. I’ve been thinking of making a full-time backpack for some time–and here is the first one. It is made from the loveliest black pebbly leather which had a former life as a large man’s winter jacket. I like to look for a long time at the pieces of leather once I have the garment cut apart and let it direct the design. 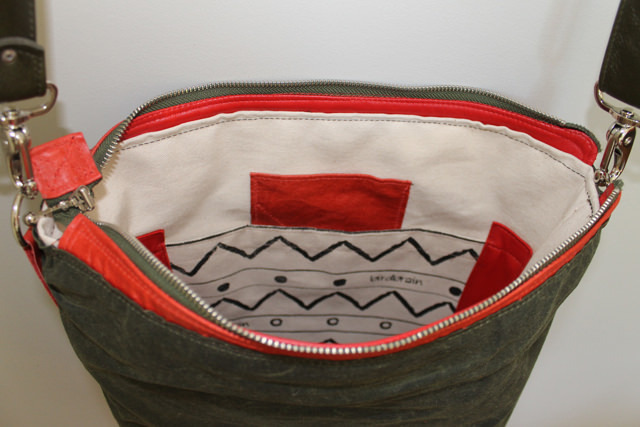 I used the top of the sleeve to make the wonky zippered pocket on the front and the rest fell into place. 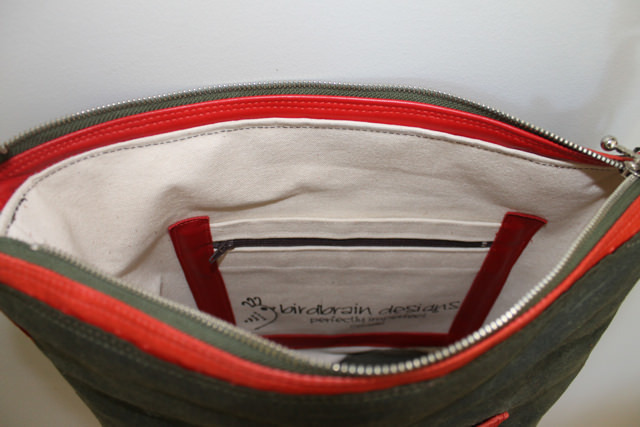 Inside it is lined with bright red cotton and has three pockets, a birdbrain canvas zip and slip and a leather phone pocket. 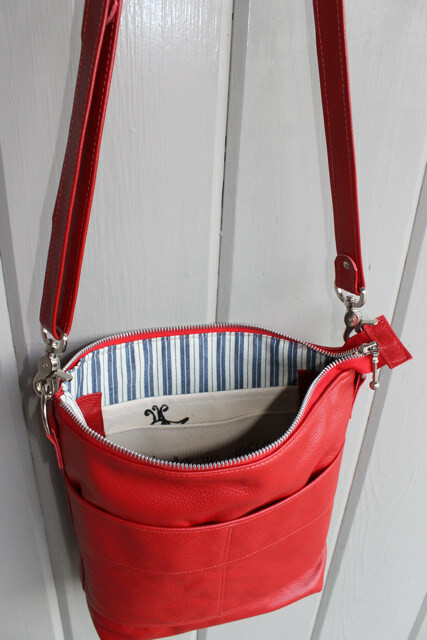 It has adjustable straps which are thick enough to be comfortable even if the bag is full. 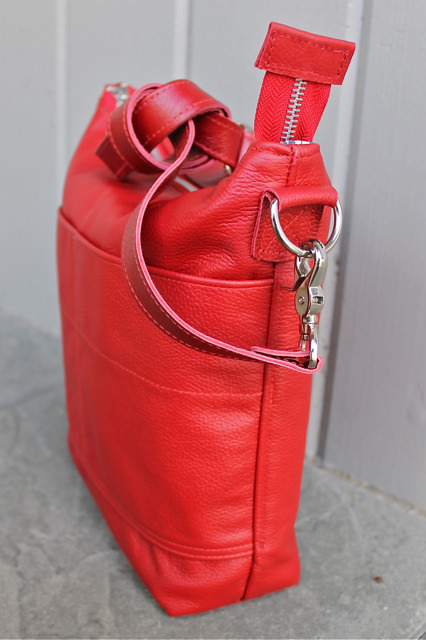 High quality hardware including a European zipper adds to the simple elegance of the bag. 12″ wide, 11.5″ tall and 3.5 ” deep. I have been wanting to make a back pack for some time. 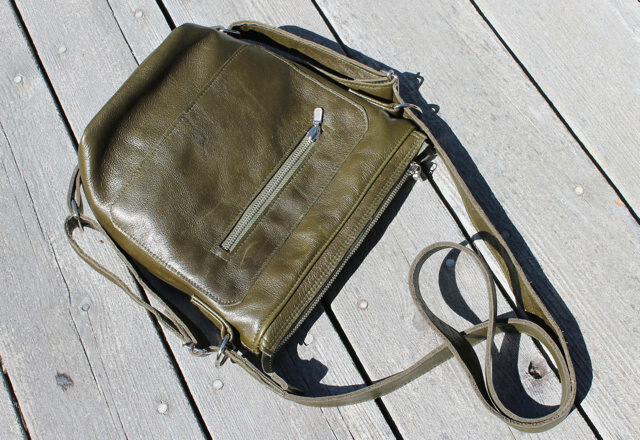 This is the first, and while it is a backpack, it can also be worn, by shifting the straps, as a cross-body bag. It is made of some beautiful leather, a green-bronze pebble. 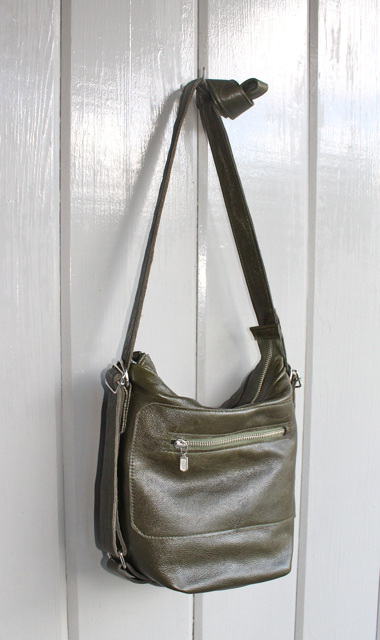 I think you would wear this bag mostly as cross-body–it is a great shape and sits easily on your hip. But if you were going on a bike, or needed hands free, you could quickly convert it into a backpack. Very handy, very versatile. Big enough to carry all you need. The PT (part-time) is 11″ wide, 10″ tall and has a base of 5″. 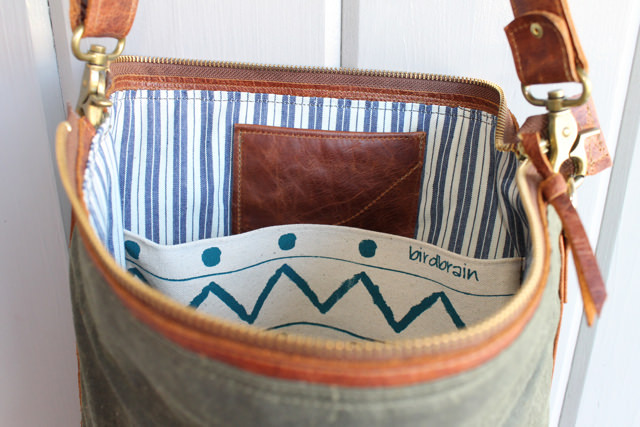 It has a double leather base, is lined in striped cotton canvas and has a zippered exterior pocket and two interior slip pockets, a leather one for your phone or passport and a larger one in birdbrain canvas. Durable metal zippers and hardware. A perfect every day bag. This is the beginning of my backpack explorations. I’m going to try my hand at a bigger one soon–no conversion just a full-time backpack. 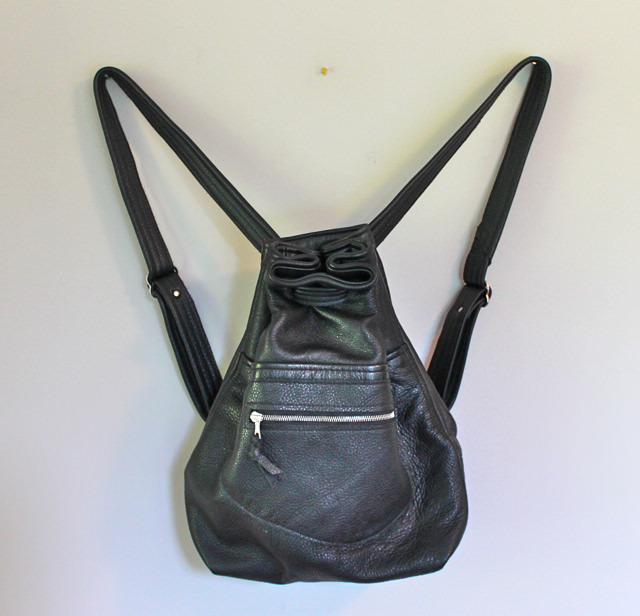 I have some recycled black pebbly leather that I think would be perfect. This is new territory for me, but that is what keeps it interesting. 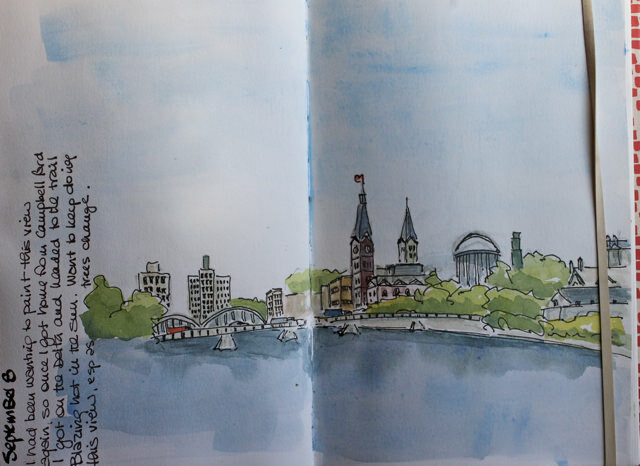 We have been having some cool sunny weather so I have been out on my bike with my sketching equipment. I was on my way to the waterfront when I saw this old beauty. This is the side view. I was able to set my stool up on the grassy shoulder of the side street and sketch away. I am still working on shadows. I need to do them in stages rather than a dark blob. I took a workshop with Marc Holmes in Montreal last year and he talked about building washes in layers of tea, milk and honey. Recently he included a ‘cheat sheet‘ explaining this process which he invited blog readers to share. It’s worth downloading and checking out for sure. Below is a quick cartoony sketch of the waterfront. I’ve decided this Fabriano sketchbook is not for me. I don’t like its size and the quality of the paper does not take washes well. But I’m sticking with it until I finish the last page–and it is encouraging me to experiment because I really don’t care how many pages I use at a time. I’m already eyeing the large Moleskine that I used for the Quebec trip. I have two trips coming in October and it will be in my travel sketching kit for sure. And finally, today’s sketch. 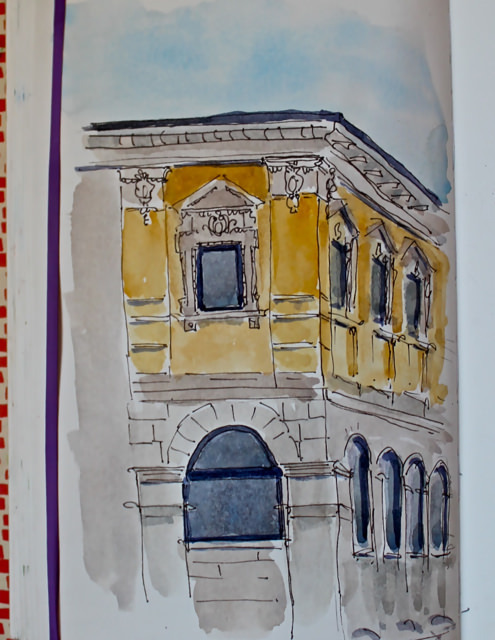 After going to the market, I sat on the bench in front of City Hall and did a quick sketch of a corner of the Jamieson Bone building. It is a lovely stone and yellow brick structure with wonderful details. Given my city’s record of knocking down historic buildings, we are very very lucky it is still standing for us to admire. 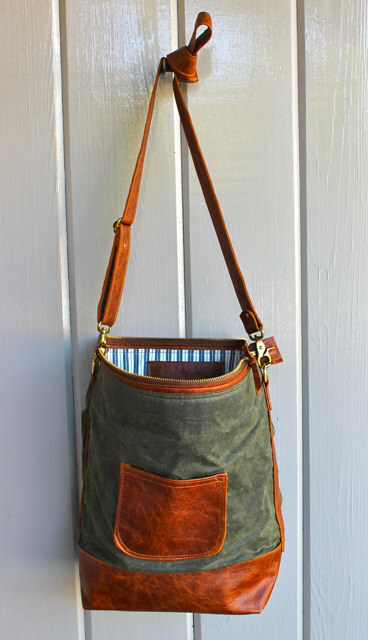 This tote is made from the same olive waxed canvas as yesterday’s sac–but this time combined with a pinch of hot cayenne. 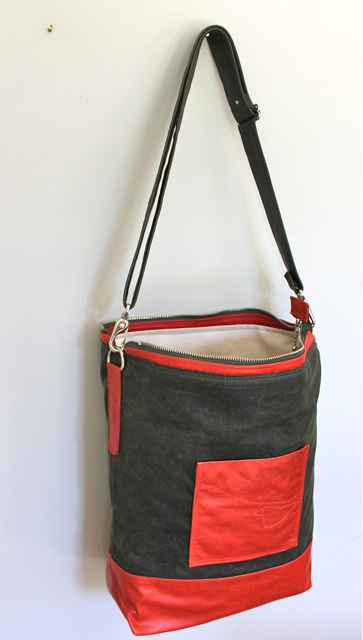 This is a large durable tote, waxed canvas and leather on the outside and canoe canvas on the interior. 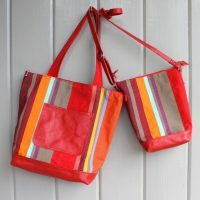 It would be a great diaper bag, book tote or travel tote and will be noticed wherever you take it. 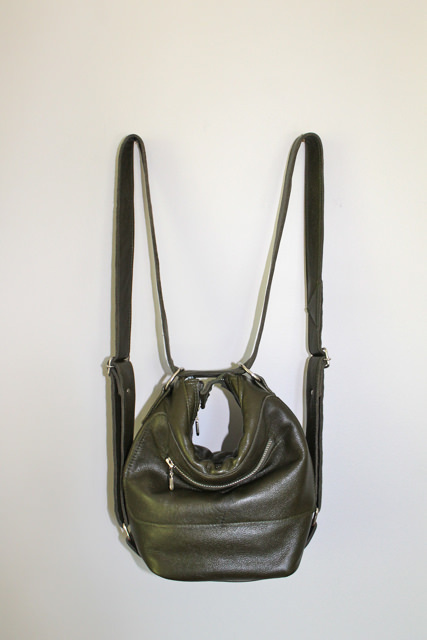 It has an adjustable strap in olive leather, a double leather bottom with ‘feet’ and high quality hardware including a metal zipper. 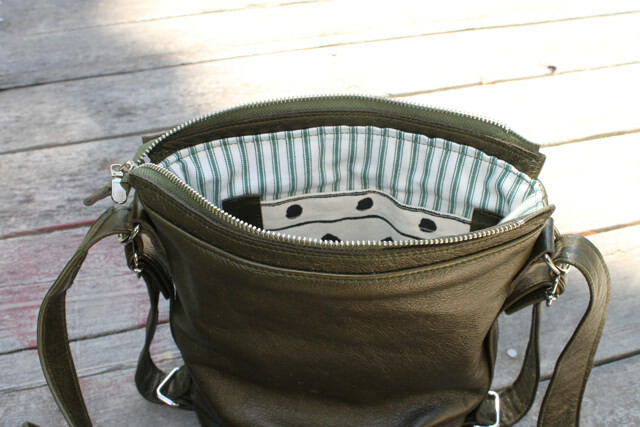 Inside there is a phone and ipad pocket on the one side and slip/zip pocket on the other. Outside there is a slip pocket with birdbrain appliqué. Height 15″. width 15″ and depth 5.5″. 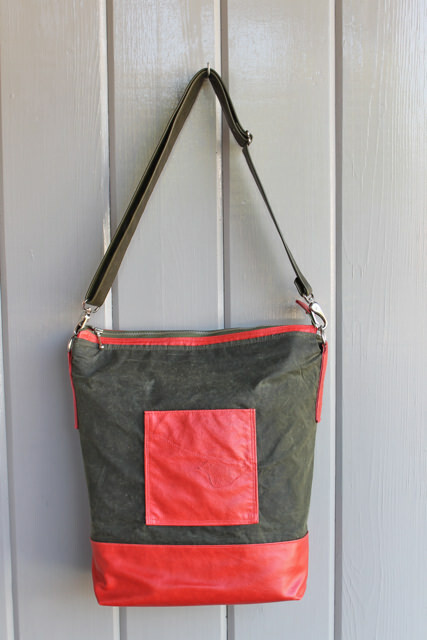 Next to leather, my favourite material for bags is waxed canvas–and I love to combine the two. 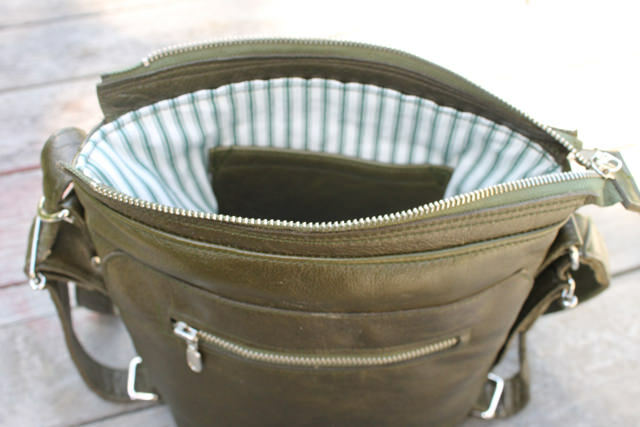 This olive waxed canvas is a 100% cotton fabric, made in the USA, with a wonderful finish which wipes clean and ages beautifully. 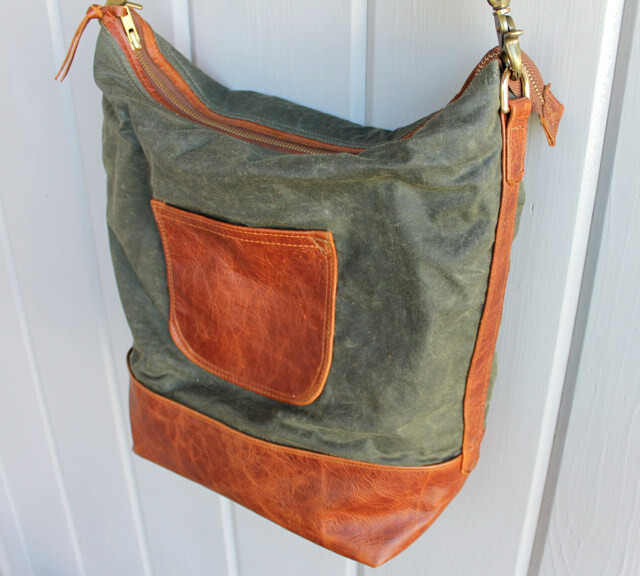 Here it is matched with a cognac leather to make a great everyday bag. 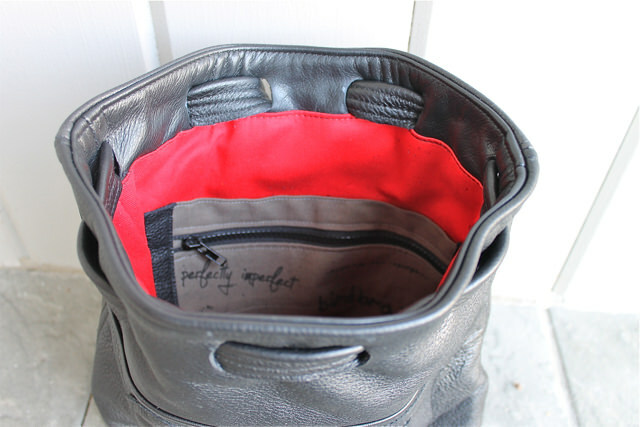 Outside there is a leather slip pocket for your keys and inside four pockets, one large enough for an ipad. 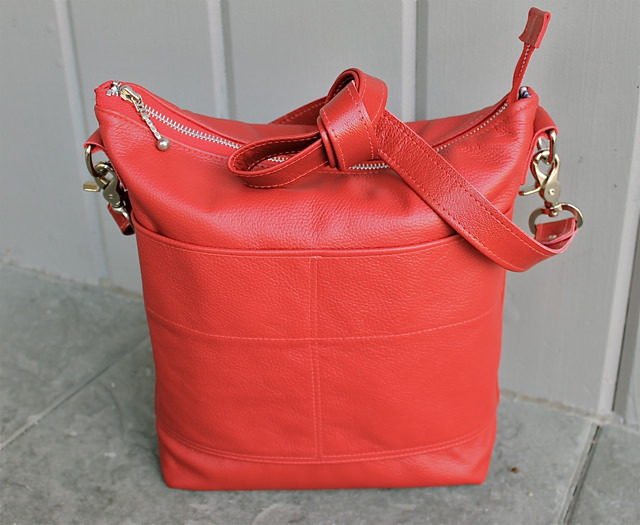 It is 14″ high and 14″ wide with a 5″ base and a long adjustable cross-body strap which can be shorted to have the sac fit under your arm. 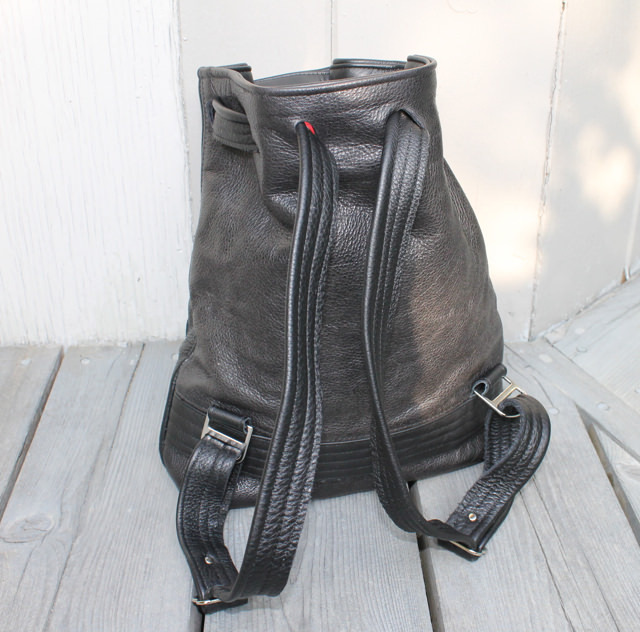 The bag is completely double stitched for strength and sports heavy duty hardware including a metal zipper. 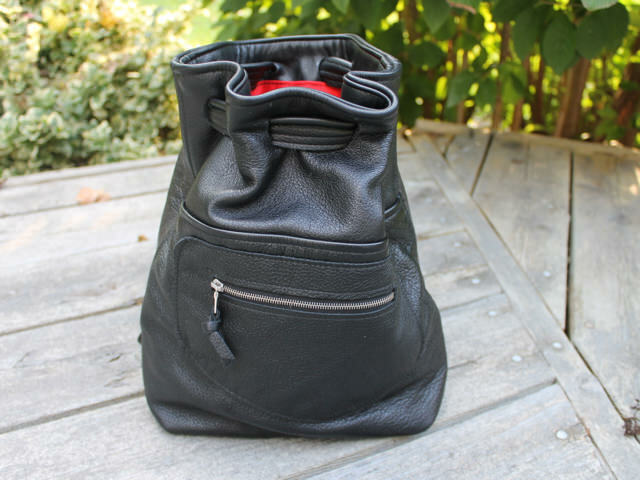 This bag is simple and ruggedly handsome; it is not too big and yet a great bag for carrying all your essentials. 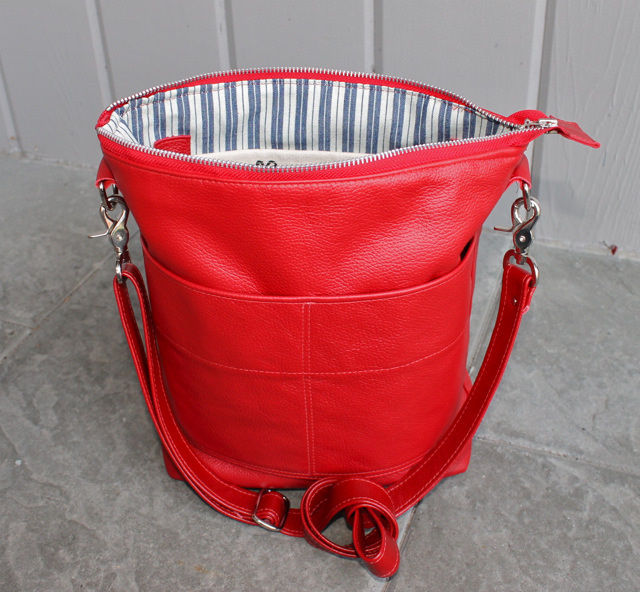 This is a great everyday bag, sturdy and roomy enough for your daily stuff with lots of pockets. It is lined in a crisp blue and white canvas and has three interior pockets, two canvas slip pockets with bird brain graphics and one leather phone pocket. 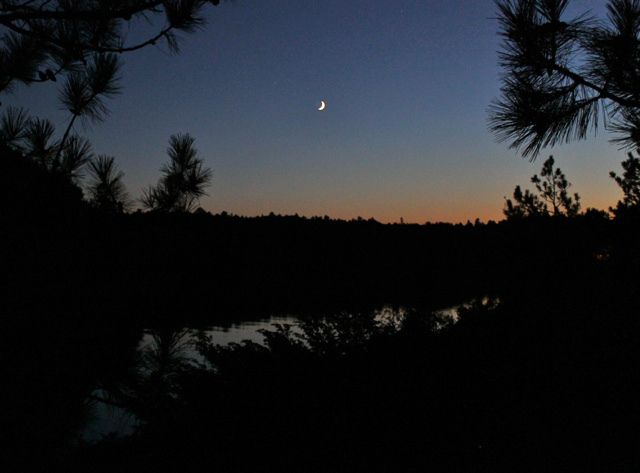 Outside, there are two generous pockets. 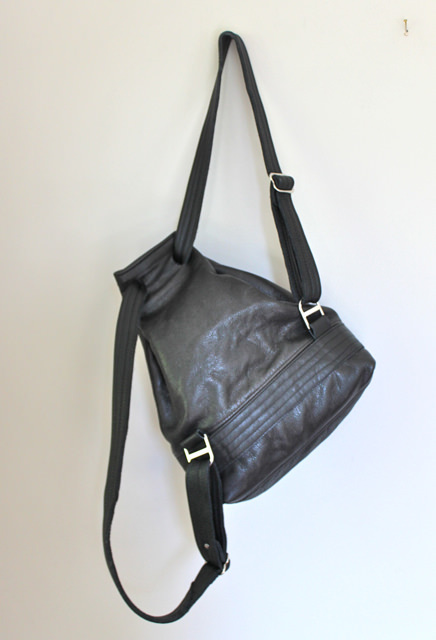 There is a double leather base with feet and an adjustable shoulder strap, durable metal zipper and hardware. 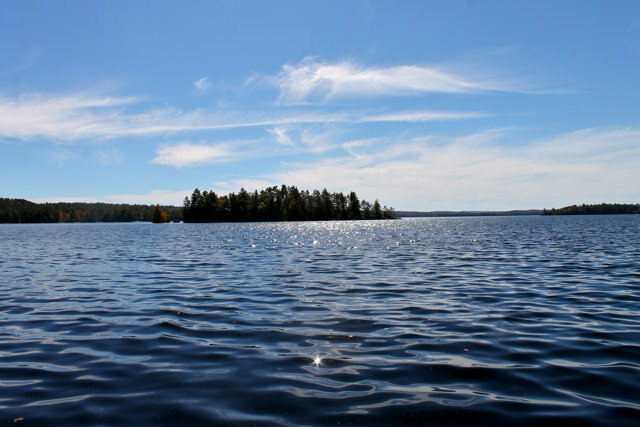 For the third year in a row, the sun shone on the Campbellford hook-in. This hook-in in this charming town on the Trent Canal is one of my favourites. It is a beautiful venue, the host group is generous with food and prizes, and lots of rug hookers with inspiring rugs are in attendance. I didn’t get a chance to photograph all of the rugs I admired, but here are a few. 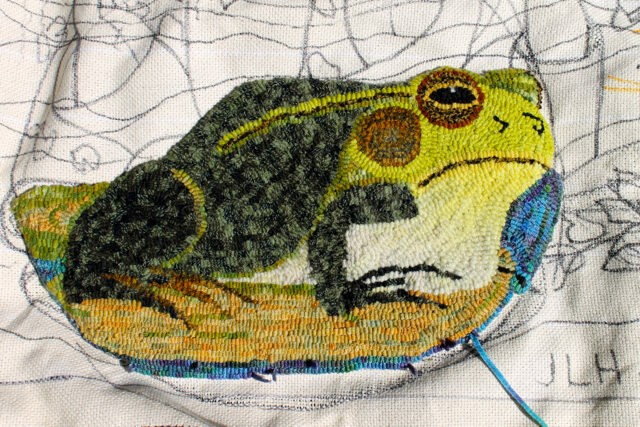 First are Jane Holland’s frog and Marg Dooher’s geometric. Both pieces use colour and texture to great advantage. The turquoise in Marg’s piece is dazzling–it demonstrates how a familiar pattern can be made extraordinary by thoughtful use of colour. 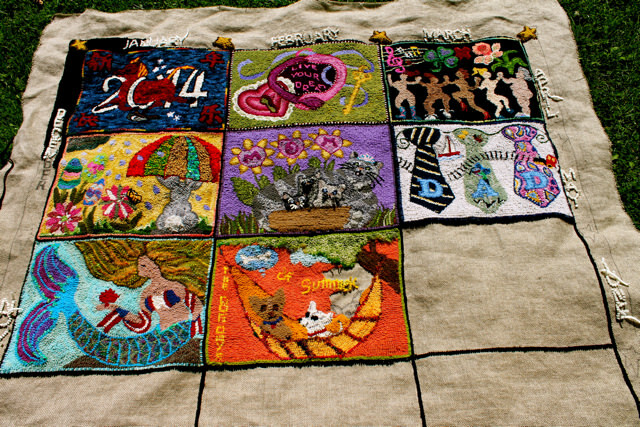 A piece that caught everyone’s eye was this calendar rug by Rosemary Malone. 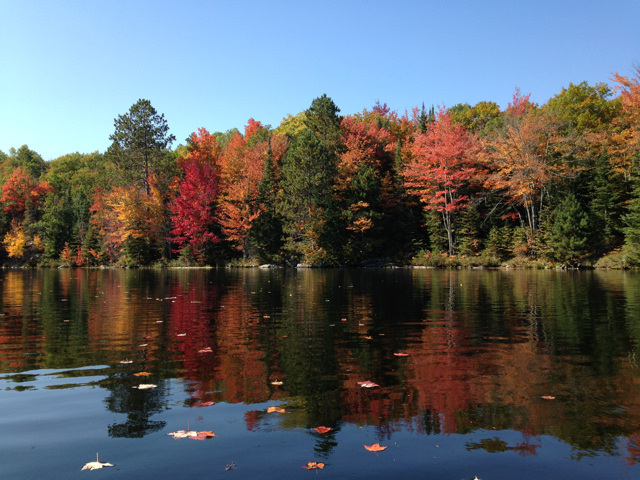 The pattern comes from Christine Little in Mahone Bay. 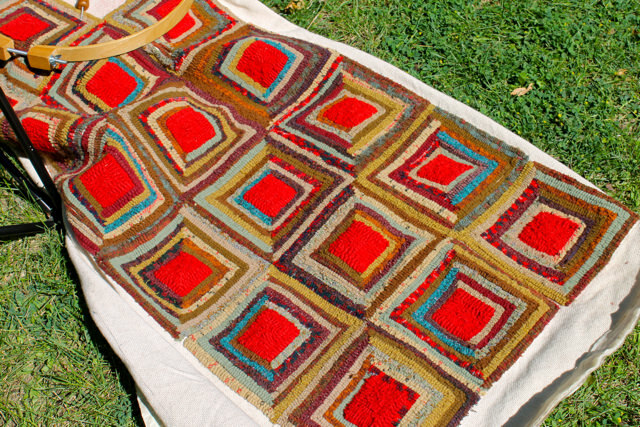 Each month Christine sends a pattern to participating rug hookers who hook it and add it to their calendar. Rosemary has won the contest for best month twice and is waiting to hear about June. 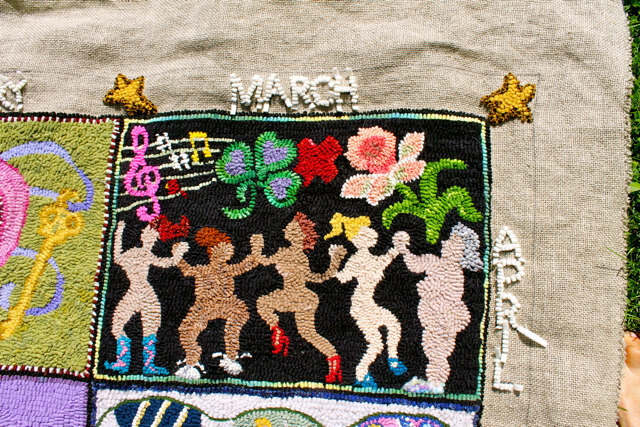 Her personalized details like the railway tracks in the June piece and the red high heels in March are what makes it so delightful. 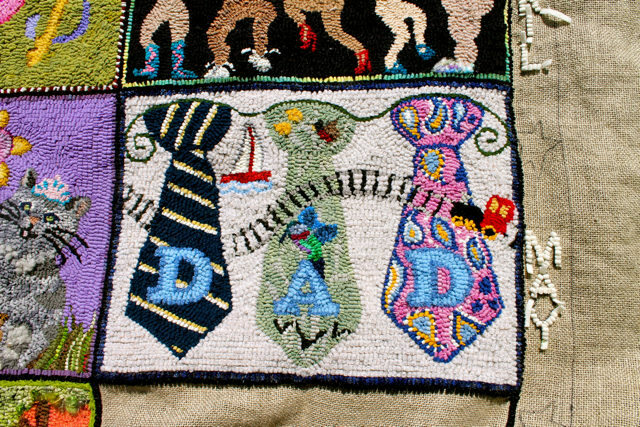 Thank you again Cambellford Rug Hookers for an inspiring and enjoyable day. 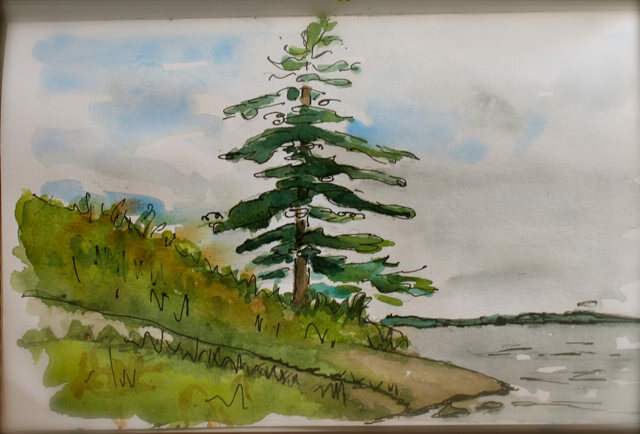 We stopped in Madoc on our way to the cottage, just long enough for me to do this sketch and to have a take-out latte in the wonderful café. I worked in Madoc in the high school for five years, but it wasn’t until I started to sketch the buildings that I really came to understand the history of the place. This church, built in 1874, is a tribute to the dignity and hard work of the early inhabitants of the area. I love the symmetry and the charming details in the arches and peaks. And those clocks are still working! Friday night we had a terrific storm. 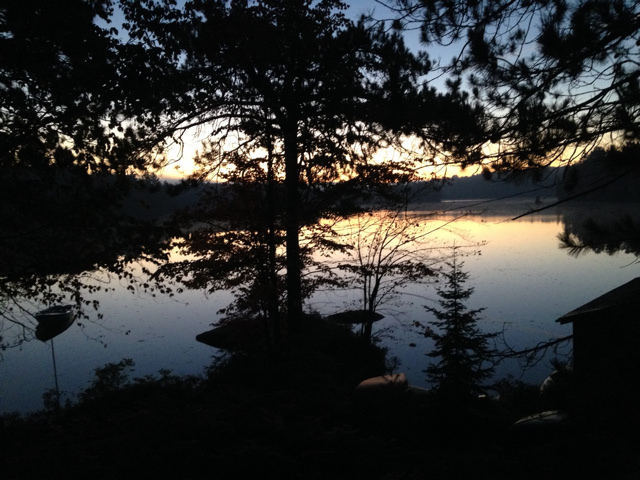 The sky was yellow and lavender against the black pines as lightening stalked the lake for over an hour. 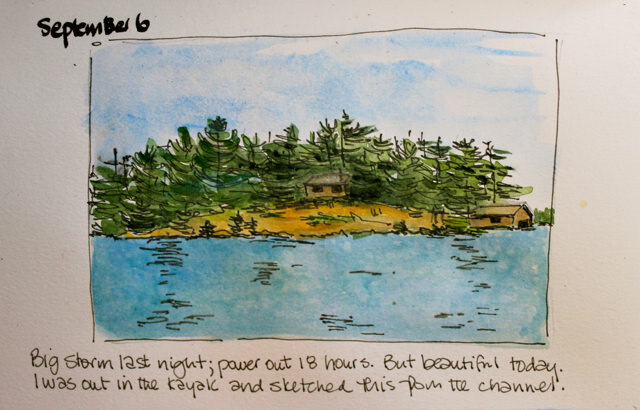 The power was off for much longer than that–but the next two days were glorious and I was able to get out in the kayak to do some sketching.